On March 6, 1990, 34-year-old Brian Moriarty handed his producer at Lucasfilm Games six floppy disks. The disks, labeled with colorful codenames like ‘mucus’ and ‘bile,’ contained the source code of his point-and-click adventure game Loom. Those disks represented about a year and a half of work, and contained some game design firsts that have since been mostly forgotten. Loom’s designer Brian Moriarty, now a professor, gave a heartfelt postmortem on the anniversary of Loom’s completion at this year’s Game Developer’s Conference. If you’ve played Loom, I think the story of how it was made will be inspiring and nostalgic. And if you haven’t played Loom, I think Moriarty’s talk would make you want to change that. Moriarty spoke about how he originally came up with the setting and story for Loom, which stars weaver Bobbin Threadbare making his way through a fantasy world of guilds and magic. Music plays a key role, and puzzles in Loom are solved by playing music, rather than using items. According to Moriarty, the idea for the story and the entire setting of Loom came to him when he saw an advertisement in a computer magazine for a circuit board; the ad copy at the bottom referred to the board as a loom, and the use of the word struck him. That was all it took to inspire Loom’s creation. Moriarty had some great stories about working at Lucasfilm Games (GM Steve Arnold had only two mandates: Don’t lose money, and don’t embarrass George) and slides of Skywalker Ranch from the late 1980s. But the parts of his talk that feel most valuable today were on the design of Loom itself. When the game was released, it was criticized for being too short and too easy. But that was an intentional part of the design. When he worked at Infocom prior to Lucasfilm Games, Moriarty learned that most players didn’t finish games, and he wanted to design a game that could be completed. He also took inspiration from a minimally interactive digital story called Inigo Gets Out, built in Hypercard. Groundbreaking adventure game Myst would use Hypercard in the same way a few years later. Loom is notably the first Lucas game that eliminated dying. Zak McKracken, released in 1987, was designed to be far less punishing than competitor Sierra’s games, but it was still possible to die. It’s also notable for using a very different interface than the other SCUMM games, with only three actions: walking, touching, and spellweaving. Moriarty credits this being possible to the flexibility of the SCUMM engine, which had very few hardcoded elements that couldn’t be changed at the programming level. A rare 256-color version of Loom for the Japanese FM Towns PC. Loom was a giant leap for Lucasfilm Games graphically. In the late 80s, computers were limited to 4-color CGA graphics and 16-color EGA graphics. Artist Mark Ferrari experimented with dithering—mixing colored pixels in a checkerboard pattern to create the illusion of another color—when he was working on Zak McKracken, but the engine’s image compression algorithm ruined the effect. In frustration, he created a gorgeous dithered landscape using EGA colors and left it on his computer screen. Lucasfilm Games’ Ron Gilbert and Steve Arnold saw that art, and a few months later, the algorithm could support dithering. Loom was their first game to use the effect in its art. The look of the game was greatly inspired by Sleeping Beauty, which wouldn’t have been possible without the nuance of dithering. Sam & Max artist Steve Purcell also helped animate Loom, and created a 3D animation—or what looks like a 3D animation—for a death scene near the end of the game. Not bad for 1989. Loom’s biggest innovation, though, was its sound. Sound designers from what would become Skywalker Sound, who have been nominated for 14 OScars, digitally recorded British voice actors for Loom in a variety of indoor and outdoor environments. The actors recorded lines together, which is still rare in VO work. Moriarty, a lifelong admirer of Tchaikovsky, had seven pieces from Swan Lake converted to MIDI to score Loom by now-legendary game composer The Fat Man. Moriarty was emotional at several points during the talk, and it was clear just how much Loom meant to him. He closed the talk by saying that if there’s one thing he truly regrets, 25 years later, it’s that he didn’t pursue his ideas for a sequel harder. Perhaps, though, it’s not too late. Loom is on Steam. Its short length may be more accepted today than it was in 1990. And though Moriarty hasn’t made an adventure game since he worked on LucasArts’ The Dig, he may be ready for a comeback. He received a standing ovation for his closing words. 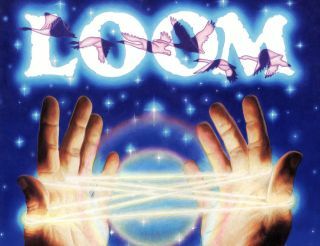 For more on Loom, read our features The best adventure games of all time and The secret history of LucasArts.